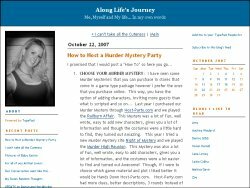 Jewel uses Murder High Reunion as her example game, but her instructions apply to nearly all Murder Mystery Parties. Thanks, Jewel, for a great write-up! Thanks a lot for the tips because I am throwing a mystery party. I could not open the page for the journal. I would love to know how to throw a murder mystery party. can u email me the info?